On behalf of the Board of Directors, we would like to express our sincere gratitude and thanks for the community’s support of the Inaugural Under the Umbrella Gala. We are grateful for the generosity of our guests, volunteers, local businesses and partners for making this event a success. We had a truly memorable night beneath the beautiful chandelier at the Chateau Lacombe on Friday, Septem-ber 16th. Guests enjoyed champagne and hors d’oeuvres while browsing a range of silent auction items during cocktail hour. 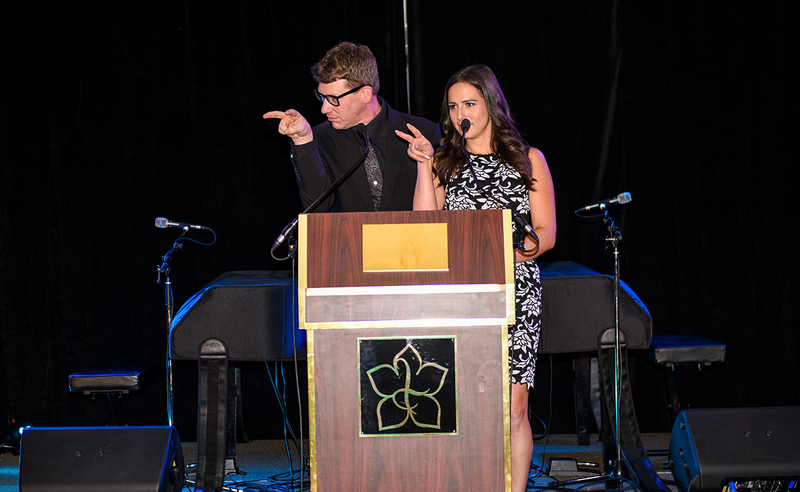 As dinner began, our wonderful emcees, Margeaux Morin and Mark Scholz welcomed guests and started off the night by bringing to light why we were there – To honour all those impacted by domestic violence. Our Executive Director, Tess Gordey, introduced the evening’s honorees, Minister Amarjeet Sohi and past client Jill. The Honorable Amarjeet Sohi discussed the importance of having a community come together and unite in the mission to end violence against women, and Jill shared her story of courage, strength and determination from ending her cycle of violence to coming out as a survivor. Guests enjoyed an incredible 3-course dinner and took part in a game of “Heads or Tails,” willing to get a little silly for a great cause. Auction bidders were excited to bid on an assortment of incredible Silent and Super Silent Auction items, with the night ending with an amazing performance by the World Famous Dueling Piano Show. The evening was truly a night to remember with the cash appeal exceeded expectations. Those of us at WIN House are incredibly grateful, and we would never be able to express our gratitude enough. During our live pledge, we raised over $34,000 to purchase a new transport van, operate the Helpline for a full year, provide over 200 babies with diapers during their 21 days in shelter, and over 30 household packages. We raised over $55,000 at this year’s gala of 150 guests, who came out to join us for an elegant evening with an important message of empowerment for women who have weathered the storm – and are ready to tell their story. We would like to give special thanks to KMG Events, Kate Gallagher and Kristine Villanueva, as well as our team Kelly Hoskins and Deanna Arthur. We would also like to convey our deepest gratitude to all of our guests, volunteers, and supporters. We can do something about it. Thank you for joining us and for acting. Together, we can end domestic violence.